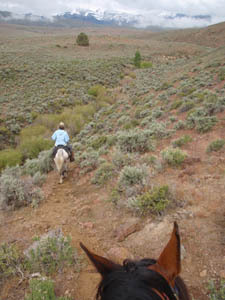 Steph said It's All About the Trails, putting on these Owyhee endurance rides. She's right, but she forgot one thing, besides the trails: It's All About Fun. Which, in this case, it meant, It's All About The Raven. If Jose and The Raven and I completed the 50 miles on Day 1 of the Owyhee Fandango, The Raven would have his 4000 miles! He's 150 miles behind me - I hit 4000 miles in April at the High Desert ride. The Raven started a year after me, hitching along on endurance rides in his own Raven bag, (among his many other adventures and accomplishments, which include sitting on the King's Royal Gold Carpet in Malaysia, and climbing Mt Whitney...) and once you start something, you just can't stop for no reason! 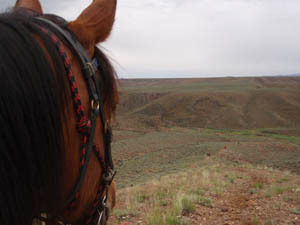 So, stuffed down in his Raven bag attached to Jose's saddle, we took off into the Owyhee morning at 7:30 AM, with a dire 70% chance of rain hanging over us in the heavily overcast skies. (And a slight chance of thunderstorms - eek!) It was hard to decide what to wear - it wasn't cold, but it was cool, and if we got wet, we'd get cold. It wasn't windy yet, but if it got windy, it could get cold. I settled on three layers and hoped for the best. Jose and The Raven and I hooked up with Nance (Tevis finisher last year!) and Quinn (my Tevis mount last year! ), Kara and Jack (Tevis finishers with us! ), and Chris and Turbo. We climbed out of Pickett Creek canyon, and motored along the southeast flats, headed for Brown's Creek across sagebrush country. 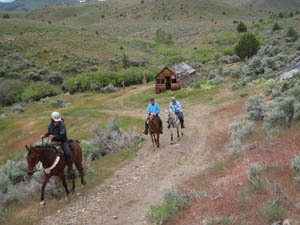 We crossed dry Little Hart Creek drainage, and running Hart Creek at the location of the old Pilot Wheel homestead. Nothing left there now but a few remnants of the home's foundation and corrals. Rumor has it that the boys that grew up there rode their horses into Oreana every day for school - about 5 miles each way. 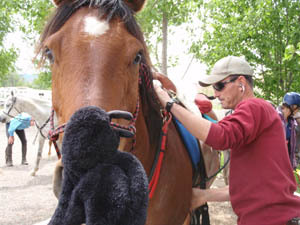 Somewhere behind me and Jose, as we led a string of horses through the sagebrush trails, we heard a Whoomp and an Uh Oh... I turned back to look and saw neighbor Carol on the ground, and her horse Suz, our training companion, trotting away. I stopped Jose and jumped off - and Suz ran right up to us, holding up her left foreleg. Her knees were skinned a bit, and she looked a bit bewildered. I just looked around for a second and the ground disappeared! Carol got to her feet unhurt, and Suz put her foot down and didn't limp, so Carol got back on. Nothing else to do but continue on, because we were halfway between home and the first out vet check at 12.5 miles. Many gates to close out on these trails; normally cows aren't out here this time of year, but there's such good grass right now that the cows are out everywhere, and the gates are closed. Which meant we had to get off for a lot of gates. I climbed off to open the first one... and that was the last one I did. I barely got it open, but it was so tight, I couldn't get the dang thing closed again. I cursed at it (sometimes that helps with barbed wire fence gates out in the Wild West), but I just couldn't quite get it. "This is a boy gate!" I yelled, and Chris jumped off to get it. Chris, who recently retired and got his knees replaced, has better knees than the rest of us, so he took to leaping off at most all the gates and doing the honors. We offered to do some but we mostly let him insist. One time he opened a gate (4 strands of barbed wire, mind) without getting off Turbo, but once he got it open, Turbo kept backing up away from it (4 strands of barbed wire on a post chasing him), so Chris had to let it go, and dismount to close it. We all made it through the first vet check with no problems - even Suz trotted out perfectly. Carol wasn't sure she wanted to continue though - next was a 25 mile loop, and what if Suz went lame in the middle of that? She decided to wait till the end of the 30 minute hold and have another look at her. They were just headed to the vet again when our group of 4 headed out onto loop 2. It was still cool and overcast, with gray floaty clouds obscuring the Owyhees... but still it didn't rain on us. It really was the perfect day for riding. The trails and dirt roads were a bit slick in a few spots from all the rain we'd had over the last few days, but nothing scary. 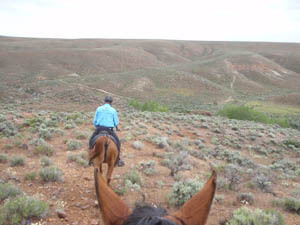 Our trail led us down into Buckaroo Creek, past the rock corral, and back up onto the flats. I'd helped Steph flag this part of the trail on Mac; Jose had never been here before. He loved leading the way fast along the trail snaking through the tall sagebrush, ducking under the taller branches and bulling his way through some of them that obscured the trail, not knowing what was on the other side. 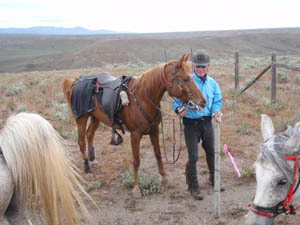 Our horses worked up a good sweat in the cool day as they gradually climbed several miles up a 2-track road to the foot of the Owyhee mountains. Some of this was new trail for me - just beautiful. The Owyhee desert looks so different in different light and different clouds - and today with the dark blue and gray clouds and wet earth, it looked like a completely different country. I never get tired of this country. I swear that Jose doesn't either, because he likes to pause and look at and study things. Nance called him a Deep Thinker, and that's what he must be doing when he absorbs the scenery. As we turned off the common trail along the Alder Creek drainage, the front-runners on the 50 came cantering toward us, including Doug Swingley on his handsome gray Ali Banta, and his wife Melanie Shirilla on MikaNika. Those two Montana'ns slipped into the endurance world from the dog mushing world: Doug won the Iditarod 4 times in the 1990's and 2000's. Our group of 4 followed Alder Creek canyon up, crossed over the flowing creek running out of a deep crevice in the mountains, then worked our way back down the other side We dropped back into Alder Creek at the Crazy Woman mine where, last August, the place was covered with sunflowers. Now sweet smelling lupine carpeted the hillsides in purple and white sheets. No word on who the Crazy Woman mine was named after. After climbing back out of Alder Creek drainage, We rejoined our out-trail and returned via the rock corral, to the Brown's Creek vet check, at 37.5 miles, for our second hold. Our horses ate and waited out their 50 minutes, while the Raven helped Jose eat, and then sat in the saddle on his back, anxiously waiting to continue the last 12.5 miles back to basecamp. By the time we left, some of the cloud cover had departed for Nevada - with the wind pushing it along. We had 12.5 miles of a very strong cool headwind to muscle through all the way back home. But it was literally a breeze for our horses, who had gotten fresher as the day went on and the miles disappeared under their feet. They all got along well, moved well at the same pace, traded the lead, drank together, ate together. And suddenly there we were, descending the trail into Pickett Creek canyon for the last 1 1/2 mile skip home. Jose and The Raven held their breaths during the final vet check: a completion for Jose, and 4000 miles for The Raven!! He got a round of applause at the awards, and he got a special little customized Pokey for his special accomplishment. I am quite sure that he is the only Raven in endurance history to ever reach 4000 miles. Not too far behind us, Carol and Suz finished their first 50 miles (Suz's knees, which looked a bit puffy at that first vet check, now looked good and tight, and she trotted out soundly), and finishing not far behind them were Tom Noll and Frank. If they finished all three days, Frank would reach 5000 career miles. 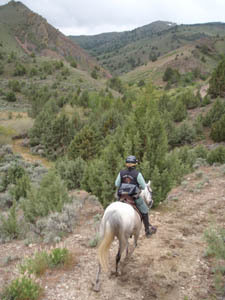 Yes, endurance riding is all about trail and fun with good people and great horses. 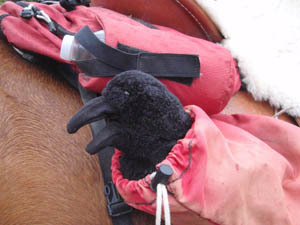 And today's Owyhee endurance ride was All About The Raven. Thank you Jose!